Rabih I. Khoury is the Managing Partner of Melwood Capital, a merchant bank that specializes in structuring private investments in the Middle East, North Africa and Turkey. Mr. Khoury has extensive experience in private equity and advisory, having executed more than US$5 billion in transactions and raised more than US$2 billion in capital. 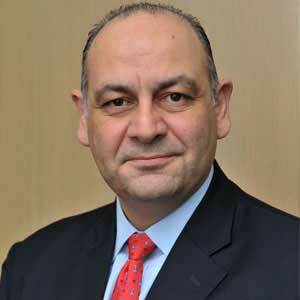 Mr. Khoury currently serves on 1) the Board of Directors of Palmboard Technology Holdings, a developer of palm leaves-based engineered wood manufacturing plants in MENA, and 2) the Advisory Board of Kalaam Telecom, a Bahrain-based Integrated Telecom Services provider. Previously, Mr. Khoury was the Chief Executive Officer of DIC Emerging Markets, in charge of Dubai International Capital’s (‘DIC’) investment portfolio in the Middle East and North Africa (MENA) region in addition to Turkey, Asia and Latin America. DIC is the international investment arm of the Dubai–based conglomerate Dubai Holding. At DIC, Mr. Khoury was responsible for deal flow origination, execution, portfolio company management and exits in Emerging Markets. Mr. Khoury served on the Board of Directors of ART Marine, Dubai Aerospace Enterprise Airports Division, CB Richard Ellis Dubai and Middle East, Energy Management Services, Ishraq Gulf Real Estate Holding Company, Jordan Dubai Capital, Jordinvest, Rivoli Holdings, and the MENA Infrastructure Fund. In addition, Mr. Khoury represented DIC on the investment committees of Dubai Aerospace Enterprise (as Chairman), Jordan Dubai Capital and the MENA Infrastructure Fund. He is also a member of the Arab Bankers Association of North America (ABANA). In New York, Mr. Khoury was a founding member of the Media & Telecom Group with Banc of America Securities, focusing on Mergers and Acquisitions, where he led broad financial advisory and restructuring services for a number of major corporations. He also worked for Prudential Securities as an Equity Research Analyst covering the Oilfield Services & Equipment sector. Prior to Prudential Securities, Mr. Khoury was a Senior Engineering Manager with URS Corporation, the world’s largest engineering design firm, where he developed new service offerings for the Energy, Technology and Biotech Sectors. He worked on the seismic rehabilitation of a number of San Francisco landmarks such as the San Francisco Civic Auditorium, the San Francisco City Hall and the United States Custom House and Appraisers Building. In addition, Mr. Khoury worked on the seismic retrofit of a number of nuclear power plants such as the Savannah River Plant, the Bellefonte Nuclear Plant and the Hanford Nuclear Site. Mr. Khoury is a past member of the Earthquake Engineering Research Institute, the Structural Engineering Association of Northern California, the American Society of Civil Engineers and the California Office of Emergency Services. He is also the recipient of the Giles Scholarship Award for outstanding contributions to the Structural Engineering Association of Northern California, and was a Registered Civil Engineer in the State of California. Mr. Khoury received his MBA from Columbia University and his MS in Structural Engineering from the University of California, Berkeley. He also received a Bachelor of Engineering with Distinction from the American University of Beirut (AUB) and graduated with Honors from Lebanon’s International College. In addition, Mr. Khoury was the President of the New York Chapter of AUB’s Alumni Association.